Left panel (The Earthly Paradise, Garden of Eden), from Hieronymus Bosch's The Garden of Earthly Delights. This artist showed in his paintings part of the desires that induce human beings in pursuit of a heaven on earth. Utopia is a term denoting a visionary or ideally perfect state of society, whose members live the best possible life. 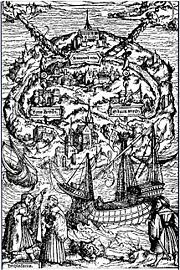 The term “Utopia” was coined by Thomas More from the Greek words ou (no or not), and topos (place), as the name for the ideal state in his book, De optimo reipublicae statu deque nova insula Utopia (Louvain, 1516). Utopianism refers to the various ways in which people think about, depict, and attempt to create a perfect society. Utopian thought deals with morality, ethics, psychology, and political philosophy, and often originates from the belief that reason and intelligence can bring about the betterment of society. It is usually characterized by optimism that an ideal society is possible. Utopianism plays an important role in motivating social and political change. The adjective "utopian" is sometimes used in a negative connotation to discredit ideas as too advanced, too optimistic or unrealistic and impossible to realize. The term “Utopian” has also been used to describe actual communities founded in attempts to create an ideal economic and political system. Many works of utopian literature offer detailed and practical descriptions of an ideal society, but usually include some fatal flaw that makes the establishment of such a society impossible. The term “Utopia” was coined by Thomas More from the Greek words ou (no or not), and topos (place), as the name for the ideal state in his book, De optimo reipublicae statu deque nova insula Utopia (Utopia Louvain, 1516). The book is narrated by a Portuguese traveler named Raphael Hythlodaeus, who criticizes the laws and customs of European states while admiring the ideal institutions which he observes during a five year sojourn on the island of Utopia. Utopia is a perfect society, where poverty and misery have been eliminated, there are few laws and no lawyers, and the citizens, though ready to defend themselves if necessary, are pacifists. Citizens hold property in common, and care is taken to teach everyone a trade from which he can make a living, so that there is no need for crime. Agriculture is treated as a science and taught to children as part of their school curriculum; every citizen spends some of his life working on a farm. The people live in 54 cities, separated from each other by a distance of at least 24 miles. The rural population lives in communal farmhouses scattered through the countryside. Everyone works only six hours a day; this is sufficient because the people are industrious and do not require the production of useless luxuries for their consumption. A body of wise and educated representatives deliberates on public affairs, and the country is governed by a prince, selected from among candidates chosen by the people. The prince is elected for life, but can be removed from office for tyranny. All religions are tolerated and exist in harmony; atheism is not permitted since, if a man does not fear a god of some kind, he will commit evil acts and weaken society. Utopia rarely sends its citizens to war, but hires mercenaries from among its warlike neighbors, deliberately sending them into danger in the hope that the more belligerent populations of all surrounding countries will be gradually eliminated. Utopia was first published in Louvain in 1516, without More’s knowledge, by his friend Erasmus. It was not until 1551, sixteen years after More's execution as a traitor, that it was first published in England as an English translation. Although some readers have regarded Utopia as a realistic blueprint for a working nation, More likely intended it as a satire, allowing him to call attention to European political and social abuses without risking censure by the king. The similarities to the ideas later developed by Karl Marx are evident, but More was a devout Roman Catholic and probably used monastic communalism as his model. The politics of Utopia have been seen as influential to the ideas of Anabaptism, Mormonism, and communism. An applied example of More's utopia can be seen in Vasco de Quiroga's implemented society in Michoacán, Mexico, which was directly taken and adapted from More's work. The word “utopia” overtook More's short work and has been used ever since to describe any type of imaginary ideal society. Although he may not have founded the genre of utopian and dystopian fiction, More certainly popularized it. Some of the early works which owe something to Utopia include The City of the Sun by Tommaso Campanella, Description of the Republic of Christianopolis by Johannes Valentinus Andreae, New Atlantis by Francis Bacon and Candide by Voltaire. The more modern genre of science fiction frequently depicts utopian or dystopian societies in fictional works such as Aldous Huxley's Brave New World (1932) Lost Horizon by James Hilton (1933), "A Modern Utopia" (1905) and New Worlds for Old (1908) by H. G. Wells, The Great Explosion by Eric Frank Russell (1963), News From Nowhere by William Morris, Andromeda Nebula (1957) by Ivan Efremov, 1984 (1949) by George Orwell, and The Giver (1993) by Lois Lowry. Authors of utopian fiction are able to explore some of the problems raised by utopian concepts and to develop interesting consequences. Many works make use of an outsider, a time-traveler or a foreigner, who observes the features of the society and describes them to the reader. Utopian thought is born from the premise that through reason and intelligence, humankind is capable of creating an ideal society in which every individual can achieve fulfillment without infringing on the happiness and well-being of the other members of society. It includes the consideration of morality, ethics, psychology, and social and political philosophy. Utopian thinking is generally confined to physical life on earth, although it may include the preparation of the members of society for a perceived afterlife. It invariably includes criticism of the current state of society and seeks ways to correct or eliminate abuses. Utopianism is characterized by tension between philosophical ideals and the practical realities of society, such as crime and immorality; there is also a conflict between respect for individual freedom and the need to maintain order. Utopian thinking implies a creative process that challenges existing concepts, rather than an ideology or justification for a belief system which is already in place. Two of Plato’s dialogues, Republic and Laws, contain one of the earliest attempts to define a political organization that would not only allow its citizens to live in harmony, but would also provide the education and experience necessary for each citizen to realize his highest potential. During the nineteenth century, thinkers such as Henri Saint-Simon, Charles Fourier, and Etienne Cabet in France, and Robert Owen in England popularized the idea of creating small, experimental communities to put philosophical ideals into practice. Karl Marx and Friedrich Engels recognized that utopianism offered a vision for a better future, a vision that contributed much to Marxism, but they also criticized utopian writers' lack of a wider understanding of social and political realities which could contribute to actual political change. Herbert Marcuse made a distinction between “abstract” utopias based on fantasy and dreams, and “concrete” utopias based on critical social theory. Utopianism is considered to originate in the imaginative capacity of the subconscious mind, which is able to transcend conscious reality by projecting images of hopes, dreams, and desires. Utopian ideas, though they may never be fully realized, play an important role in bringing about positive social change. They allow thinkers to distance themselves from the existing reality and consider new possibilities. The optimism that a better society can be achieved provides motivation and a focal point for those involved in bringing about social or political change. Abolitionism, women’s rights and feminism, the Civil Rights movement, the establishment of a welfare system to take care of the poor, the Red Cross, and multiculturalism are all examples of utopian thinking applied to practical life. The harsh economic conditions of the nineteenth century and the social disruption created by the development of commercialism and capitalism led several writers to imagine economically utopian societies. 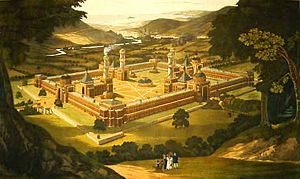 Some were characterized by a variety of socialist ideas: an equal distribution of goods according to need, frequently with the total abolition of money; citizens laboring for the common good; citizens doing work which they enjoyed; and ample leisure time for the cultivation of the arts and sciences. One such utopia was described in Edward Bellamy's Looking Backward. Another socialist utopia was William Morris' News from Nowhere, written partially in criticism of the bureaucratic nature of Bellamy's utopia. Capitalist utopias, such as the one portrayed in Robert A. Heinlein's The Moon Is a Harsh Mistress or Ayn Rand’s The Fountainhead, are generally individualistic and libertarian, and are based on perfect market economies, in which there is no market failure. Eric Frank Russell's book The Great Explosion (1963) details an economic and social utopia, the first to mention of the idea of Local Exchange Trading Systems (LETS). Political utopias are ones in which the government establishes a society that is striving toward perfection. These utopias are based on laws administered by a government, and often restrict individualism when it conflicts with the primary goals of the society. Sometimes the state or government replaces religious and family values. A global utopia of world peace is often seen as one of the possible inevitable ends of history. Through history a number of religious communities have been created to reflect the virtues and values they believe have been lost or which await them in the Afterlife. In the United States and Europe during and after the Second Great Awakening of the nineteenth century, many radical religious groups sought to form communities where all aspects of people's lives could be governed by their faith. Among the best-known of these utopian societies were the Puritans, and the Shaker movement, which originated in England in the eighteenth century but moved to America shortly after its founding. The most common utopias are based on religious ideals, and usually required adherence to a particular religious tradition. The Jewish, Christian and Islamic concepts of the Garden of Eden and Heaven may be interpreted as forms of utopianism, especially in their folk-religious forms. Such religious "utopias" are often described as "gardens of delight," implying an existence free from worry in a state of bliss or enlightenment. They postulate existences free from sin, pain, poverty and death, and often assume communion with beings such as angels or the houri. In a similar sense the Hindu concept of Moksha and the Buddhist concept of Nirvana may be thought of as a kind of utopia. Many cultures and cosmogonies include a myth or memory of a distant past when humankind lived in a primitive and simple state of perfect happiness and fulfillment. The various myths describe a time when there was an instinctive harmony between man and nature, and man’s needs were easily supplied by the abundance of nature. There was no motive for war or oppression, or any need for hard and painful work. Humans were simple and pious, and felt themselves close to the gods. These mythical or religious archetypes resurge with special vitality during difficult times, when the myth is not projected towards the remote past, but towards the future or a distant and fictional place (for example, The Land of Cockaygne, a straightforward parody of a paradise), where the possibility of living happily must exist. Works and Days, compilation of the mythological tradition by the Greek poet Hesiod, around the eighth century B.C.E., explained that, prior to the present era, there were four progressively most perfect ones. A medieval poem (c. 1315) , entitled "The Land of Cokaygne" depicts a land of extravagance and excess where cooked larks flew straight into one's mouth; the rivers ran with wine, and a fountain of youth kept everyone young and active. In goods or riches to compare. Scientific and technical utopias are set in the future, when it is believed that advanced science and technology will allow utopian living standards; for example, the absence of death and suffering; changes in human nature and the human condition. These utopian societies tend to change what "human" is all about. Normal human functions, such as sleeping, eating and even reproduction are replaced by artificial means. Dystopia is a negative utopia: a world wherein utopian ideals have been subverted. Examples include George Orwell's 1984 and Aldous Huxley's Brave New World. Eutopia is a positive utopia, roughly equivalent to the regular use of the word "utopia." Heterotopia, the "other place," with its real and imagined possibilities (a mix of "utopian" escapism and turning virtual possibilities into reality)—example: cyberspace. Samuel R. Delany's novel Trouble on Triton is subtitled An Ambiguous Heterotopia to highlight that it is not strictly utopian (though certainly not dystopian). The novel offers several conflicting perspectives on the concept of utopia. Ourtopia combines the English 'our' with the Greek 'topos' to give 'our place'—the nearest thing to a utopian planet that is actually attainable. The City of God, (written 413–426) by Augustine of Hippo, describes an ideal city, the “eternal” Jerusalem, the archetype of all “Christian” utopias. Reipublicae Christianopolitanae descriptio (Beschreibung des Staates Christenstadt) (1619) by Johann Valentin Andrea describes a Christian religious utopia inhabited by a community of scholar-artisans and run as a democracy. The Anatomy of Melancholy (1621) by Robert Burton, a utopian society is described in the preface. The City of the Sun (1623) by Tommaso Campanella depicts a theocratic and communist society. Oceana (1656) the Integral, praising the efficiency, the rationality, and the happiness that life within the confines of the One State can bring to those worlds the Integral will someday visit. William Morris’ News From Nowhere describes a utopian England that has deindustrialized and returned to a cooperative pastoral lifestyle. Looking Backward (1888) by Edward Bellamy. New Australia was a utopian movement founded in 1893 in Paraguay by William Lane. Aldous Huxley's Brave New World (1932) can be considered an example of pseudo-utopian satire. One of his other books, Island (1962), demonstrates a positive utopia. Islandia (1942), by Austin Tappan Wright , an imaginary island in the Southern Hemisphere containing many Arcadian elements, including a rejection of technology. In The Great Explosion by Eric Frank Russell (1963), the last section sets out a workable utopian economic system leading to a different social and political reality. Full text of Thomas More's Utopia, Project Gutenberg. This page was last modified on 13 January 2016, at 16:31.